Recently, videos depicting sodas melt teeth, meat and get the rust off cars or metal bars have taken over the internet. People are genuinely appalled by such demonstrations and vow to never drink soda again because they consider this to be irrefutable proof of the harmful effects the beverages have on our health. As laudable as these efforts may be, these videos do not tell the entire truth, but merely fructify one of the properties of phosphoric acid in the beverages. The fact that sodas can slowly dissolve a chunk of meat is not the real reason to stop drinking them. Our stomach juice is actually much more stronger than the acid found in sodas and, if it weren’t for the genius defense mechanisms our body boasts, gastric acid would burn a hole through us. What are then the real reasons why sodas are bad for us, especially when consumed excessively? And how come phosphoric acid, the meat-dissolving and rust-cleaning substance in sodas, is the least of our worries? Let’s find out. Phosphoric acid, a not-so-healthy substance, is derived from phosphorus, a dietary mineral with wonderful health benefits. It is commonly added to fizzy drinks. Phosphoric acid is used as a flavor additive and, like any other acid, it has corrosive properties. The latest health frenzy depicts Coca cola brands used to clean rust off metal bars or dissolve meat or even teeth or chicken bones. For the simple-minded, this is irrefutable proof of the danger of the drink, not to mention bad publicity for the brand. Nonetheless, things are more than meets the eye. Indeed, fizzy drinks are not very healthy and, in time, they may cause serious illnesses such as obesity and type 2 diabetes or put strain on our immune system because the sugar in fizzy drinks competes for absorption with nutrients such as vitamin C to enter cells and immune system cells need plenty of vitamin C to function optimally. However, regardless of the good intentions behind these videos, every decision we make should be based on scientific evidence rather than misinformation. Yes, fizzy drinks are bad for us, but not necessarily because of their phosphoric acid content. Most fizzy drinks contain food preserving agents and additives. Although bigger brands have ingredients of relatively higher quality, smaller and cheaper ones may indeed use potentially dangerous ingredients, especially some food dyes. But we’ll get back to this. 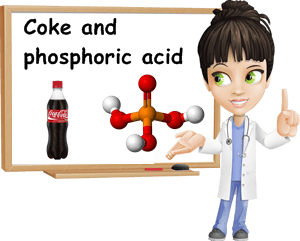 As far as the phosphoric acid content in fizzy drinks is concerned, we should all keep in mind something very important: the acid in our stomach, hydrochloric acid, is much more corrosive than phosphoric acid. Hydrochloric acid occurs naturally within our stomach and is a major component of gastric acid, and a natural secretion of our stomach. If it weren’t for the thick layer of mucus protecting our stomach walls from it, hydrochloric acid would simply burn through us, leaving a giant hole. So it could probably dissolve chicken bones or a tooth even faster than soda. In comparison, phosphoric acid is much less corosive. Although this may prove an extremely unpopular idea, it is sometimes good to take a few sips of cola when eating fatty or heavy dishes containing meat especially. The phosphoric acid will act as a digestive aid. However, I’m not recommending making fizzy drinks part of your diet. Although I am aware of the fact that a glass of cola won’t burn a hole through our stomach, it does contain rather unhealthy ingredients which, if consumed regularly and in large amounts, can prove hazardous to our health. If you want a reason not to drink sodas, don’t put the blame of phosphoric acid. A more likely culprit would be food dye or sugar. A regular consumption of such products presupposes a high intake of sugar which is without a doubt extremely unhealthy. Not only will it raise blood sugar levels and cause hyperglycemia and diabetes, but it may also lead to poor immunity, possibly by over-straining the immune system which might not be as attentive to potential pathogens or disease. Also, refined sugar is believed to create a predisposition for cancer. Whether it is because foods high in sugar, usually processed foods, limit the intake of healthy, natural foods and the nutrients in them, put too much strain on the immune system or because you need to cook sugar until it’s, well, burnt, to give that caramel pigment and flavor to some sodas, making it a potential carcinogen, it’s a health hazard when consumed in high amounts. Have you ever wondered how many teaspoons of sugar one 2-liter bottle of soda contains? Up 70 or more, depending on the brand. But there is more. Food dyes are far more likely to cause serious health problems rather than phosphoric acid. Natural food colorings are less bright, so less appealing to us, and more expensive than chemically-produced ones, which makes them less appealing to producers. Even worse, food dyes are, to some extent, toxic for the human body. Some studies even suggest that they may cause cancer. Many artificial food dyes have already been forbidden in certain countries. However, some remain, although researchers advocate their toxicity. For instance, Yellow No. 5 and 6 are known to cause hyperactivity in children and significantly worsen ADHD symptoms (Link). The caramel coloring found in darker soda varieties constitutes another threat to our health because preliminary studies (on animals) suggest it has carcinogenic effects. For more information on food dyes, check out this food coloring guide. Even more, the fact that many artificial food dyes are produced from coal tars is alarming. Coal tar is a known carcinogen and exposure to it is a genuine health hazard. Although the amounts found in food coloring are very low, prolonged consumption is damaging to one’s health. Because restrictions are much more harsh, more and more companies nowadays have resorted to natural food coloring, obtained from natural sources such as beta-carotene, paprika, turmeric or saffron. Since this is not the case with fizzy drinks, limiting consumption is imperative if you want to keep in good health. Those who resolve to never drink such products again are the real winners. Conclusion. So, if you ever feel impressed when someone shows you a video of how soda can dissolve a piece of meat or a tooth, think about the fact that our gastric acid can dissolve us. And also think about the fact that all those beautiful, bright colors you see on supermarket shelves, in sodas, macaroni or cakes, are as unhealthy as can be. If you are looking for reasons not to drink fizzy drinks, here are they. Whatever you decide to do, always make sure you have all the right information.